IMAGE: Wine Cellar, Brooklyn Bridge, 1992, by photographer Stanley Greenberg, via Urban Omnibus, where you can also view it much larger. Photographer Stanley Greenberg likes to shoot hidden spaces and invisible infrastructure — the overlooked, neglected, or simply off-limits “back-end” of the systems that shape our world. During a conversation at Studio-X NYC last week about his new work — photographs taken behind the scenes of large-scale physics experiments, of which more later — Greenberg briefly discussed the image shown above. 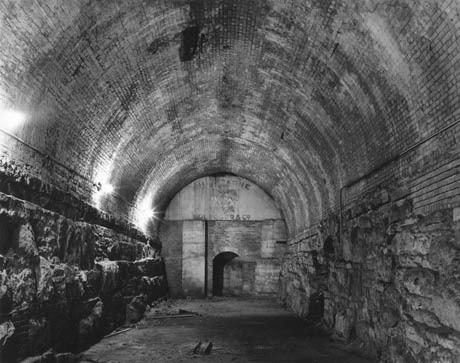 For many years the vault pictured here, located under the Manhattan approach to the bridge, was rented to a wine merchant for champagne storage because the temperature changed so little during the year. Other vaults similar to this one contain rusting fallout shelter helmets and casting patterns for the specialized parts of many of the city’s old bridges. 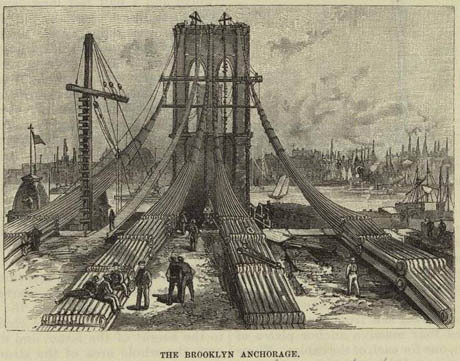 IMAGE: Constructing the anchorage of the Brooklyn Bridge in 1883, via Encyclopedia Branigan. This hidden vault has surfaced sporadically in the public imagination, beginning with a Pittsburgh Post-Gazette article from 1933 (the year Prohibition was repealed) that describes a public ceremony in which the city handed its keys back to wine importers Anthony Oechs & Co.
Alongside equally fascinating stories on forthcoming weddings (one of a Siamese twin, the other of Gilda Gray, “originator of the shimmy dance”) and the progress of the ladies of the Polish-American track and field team, the Gazette describes passing “through a cave-like door into medieval France,” where “a few hundred lucky citizens” drank champagne and waltzed amidst the “dimly glowing” cases of “rare vintages of the old world,” oblivious to the trolleys, pedestrians, and automobiles racing back and forth fifty feet above their heads. IMAGE: From the Pittsburgh Post-Gazette, July 12, 1934. A space between two arches of the Manhattan end of the Brooklyn Bridge was known as the “Blue Grotto” because of a statue of the Madonna that someone placed in a niche to bless the booze. It once held the finest supply of champagne and wine in the city. During Prohibition, the liquor was removed and the vault was used to store rolls of newsprint. On the walls of this vault, which is underneath William Street and Park Row, are fading frescoes and the following wise inscription: WHO LOVETH NOT WINE, WOMEN AND SONG, HE REMAINETH A FOOL HIS WHOLE LIFE LONG. City records for 1901, for instance, show that the “Luyties Brothers” paid $5,000 for wine storage in a vault on the Manhattan side. “A. Smith & Company” paid $500 a year from 1901 until 1909 for a vault on the Brooklyn side. Sadly, these artificial bridge caves are no longer used for wine storage. A spokeswoman for the Department of Transportation told the Times that the vaults now house maintenance materials, although “people call up sometimes and say they’d like to live there.” A slightly over-excited Maxim film critic, taken down to the vault as part of the Sony promotion for the 2009 remake of The Taking of Pelham 1 2 3, reports that, in fact, a homeless man did build “some kind of Escape From New York-esque apartment” in the wine cellar, and had to be forcibly evicted by the MTA. IMAGE: The Brooklyn Bridge wine cellar; photo by Flickr user Pauletto. Still, as this 2011 photo by Flickr user Pauletto shows, the brick-vaulted, granite-walled cellar is still in reasonably good shape, although the Madonna is nowhere to be seen, and the Pol Roger insignia has faded further since Stanley Greenberg’s visit, a decade before. 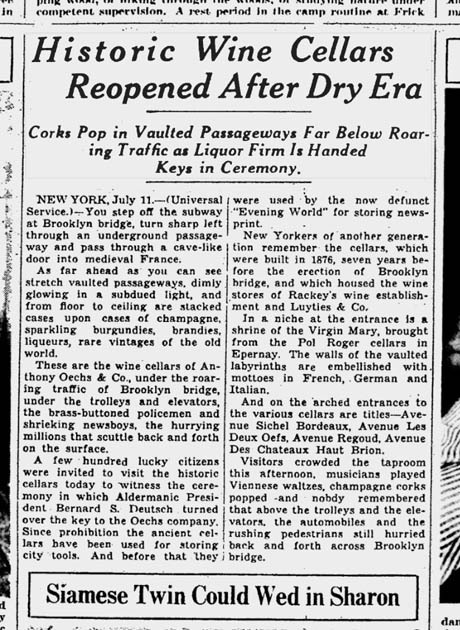 Meanwhile, the idea of cellaring fine wine and spirits in the base of New York City’s infrastructural monuments is a poetic one, and, I think, overdue a revival in this era of local, artisanal production. Where better to store Kings County Distillery moonshine or cave-age Brooklyn Brewery’s ales? 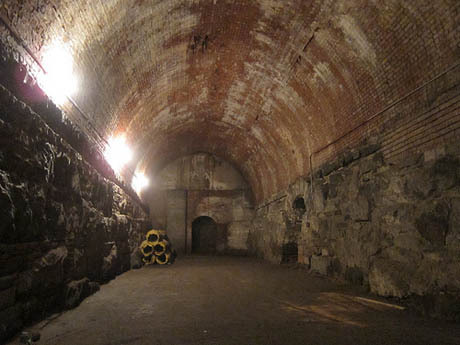 For more of New York City’s subterranean alcohol infrastructure, see my 2009 post on the rediscovered and now filled-in Bronx beer caves. 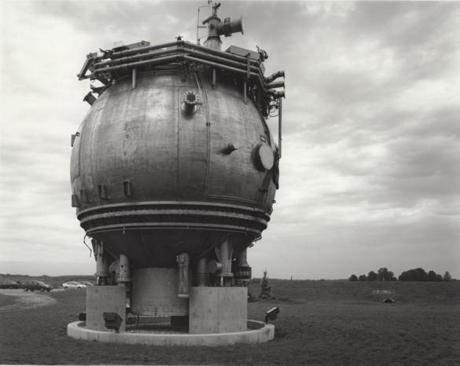 And, as a further postscript, Stanley Greenberg’s most recent book Time Machines, includes this incredible image of a disused bubble chamber, the early prototypes of which, as Studio-X NYC regular Albert Chao pointed out to me, were filled with beer. IMAGE: 15-foot bubble chamber, Fermilab, Illinois, 2006; photo by Stanley Greenberg. Well I don’t know what gives today, but on the Brooklyn side, down in the spaces under the Brooklyn anchorage, they were giving parties there as recently as 1999-2000. I know because I was at a couple.